The flight school will offer experience, training and qualifications to aspiring young Chinese and broader Asia-Pacific recreational pilots, giving them a lead-in to a flying profession which is in particularly high and steeply rising demand in China since that country deregulated its air space in 2015, allowing private recreational aviation for the first time. The training courses developed by SAA not only focus on pilot training, but also provide the necessary skills for a wide range of aviation related jobs that support the industry. At every possible opportunity, this new college will use locally sourced materials and labour, to support the local economy that it will be a part of, says Sports Aviation Australia CEO, Mr Mitch Boyle, who is not only passionate about aviation and a qualified instructor, but was also a resident of Merimbula on the South Coast for over eight years while studying and earning his flight qualifications. Hundreds of other jobs will be created, because if more people move to the region for the direct jobs, they will have to be looked after by the town in terms of accommodation, food and leisure, so more money will be spent in the South Coast towns they move to. TAFE jobs will be created for the local Bega TAFE, because many of the staff will need training prior to working at the college. This includes office, kitchen, catering, grounds, assembly and maintenance staff. All students will be equipped with an iPad that contains all their training, course notes and maps. Each aircraft is fitted with a GoPro and cultural days will be filmed too, so the students can share their experiences of the beautiful NSW South Coast with their home countries. Students will be taken to experience Australian culture. This will include local attractions like Potoroo Palace, a not-for-profit native animal sanctuary in Merimbula, or the ‘On the Perch’ Aviary in Kalaru. SAA will make every effort to engage with the local indigenous community to provide employment opportunities wherever possible. Sports aviation believes the SAA College is the only recreational flight college designed to specifically address the needs of the Chinese and broader Asia-Pacific recreational aviation industry and the first of its type for Australia. To provide a solution that caters to the Chinese market’s needs, the course is to be run as a ‘package’ for each student. • Recognised RAA pilot certificate and recreational pilot’s licence and flight college certificates for aviation English, aircraft maintenance and aircraft assembly. The flight college will have all of the student accommodation and teaching facilities built on-site. These facilities will include classrooms for the aviation English and flight theory, individual rooms and amenities for each student. Sports Aviation Australia flight schools will be overseen by a qualified and experienced Chief Flying Instructor (CFI). The CFI’s are often supported by Senior Instructors (SI) who are similarly skilled and able to provide the highest standard of training. The aircraft used predominately throughout flight training is the Bantam (top). 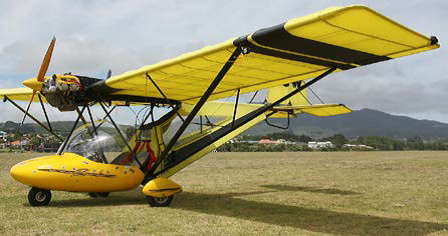 This plane is a good all-rounder and is manufactured by a NZ company called MicroAviation. SAA has negotiated exclusively this aircraft for flight college training and post-study sales into China. The aircraft will be assembled at the flight college’s aircraft assembly facility at Frogs Hollow. Other aircraft deployed by SAA include the Australian-manufactured trike, left, on which students will receive an introductory course. The third type is the more traditional general aviation type of aircraft, the Brumby, right, which will be used for more advanced RPL training. The Brumby is an Australian-designed plane manufactured in Cowra, NSW. To ensure a consistent and safe experience, all RAA schools are subject to compliance audits undertaken by RAA. The schools operate a variety of aircraft, which are also required to undergo a rigorous maintenance program to ensure reliability and safety for all RAA members and the community of which they are part.